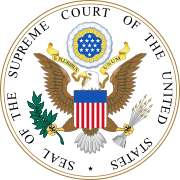 The Supreme Court of the United States (also referred to by the acronym SCOTUS) is the highest court in the federal judiciary of the United States. Established pursuant to Article III of the U.S. Constitution in 1789, it has original jurisdiction over a narrow range of cases, including suits between two or more states and those involving ambassadors. It also has ultimate (and largely discretionary) appellate jurisdiction over all federal court and state court cases that involve a point of federal constitutional or statutory law. The Court has the power of judicial review, the ability to invalidate a statute for violating a provision of the Constitution or an executive act for being unlawful. However, it may act only within the context of a case in an area of law over which it has jurisdiction. The court may decide cases having political overtones, but it has ruled that it does not have power to decide nonjusticiable political questions. Each year it agrees to hear about one hundred to one hundred fifty of the more than seven thousand cases that it is asked to review. It was while debating the division of powers between the legislative and executive departments that delegates to the 1787 Constitutional Convention established the parameters for the national judiciary. Creating a "third branch" of government was a novel idea; in the English tradition, judicial matters had been treated as an aspect of royal (executive) authority. Early on, some delegates[who?] 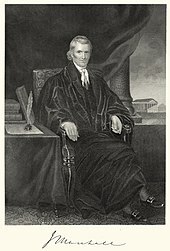 argued that national laws could be enforced by state courts, while others, including James Madison, advocated for a national judicial authority consisting of various tribunals chosen by the national legislature. It was also proposed that the judiciary should have a role in checking the executive power to veto or revise laws. In the end, the Framers compromised by sketching only a general outline of the judiciary, vesting federal judicial power in "one supreme Court, and in such inferior Courts as the Congress may from time to time ordain and establish". They delineated neither the exact powers and prerogatives of the Supreme Court nor the organization of the Template:Judicial branch as a whole. The Supreme Court consists of a chief justice, currently John Roberts, and eight associate justices. Among the current members of the Court, Clarence Thomas is the longest-serving justice, with a tenure of 7004100390000000000♠10,039 days (7004100390000000000♠27 years, 177 days) as of April 18, 2019; the most recent justice to join the court is Brett Kavanaugh, whose tenure began on October 6, 2018. Following the confirmation of Brett Kavanaugh in 2018, the Court currently consists of five justices appointed by Republican presidents and four appointed by Democratic presidents. It is popularly accepted that Chief Justice Roberts and associate justices Thomas, Alito, Gorsuch, and Kavanaugh, appointed by Republican presidents, comprise the Court's conservative wing. Justices Ginsburg, Breyer, Sotomayor and Kagan, appointed by Democratic presidents, comprise the Court's liberal wing. Gorsuch had a track record as a reliably conservative judge in the 10th circuit. Kavanaugh was considered one of the more conservative judges in the DC Circuit prior to his appointment to the Supreme Court. ^ Liptak, Adam (2010-07-24). "Court Under Roberts Is Most Conservative in Decades". New York Times. New York, New York. Retrieved 2019-02-01. When Chief Justice John G. Roberts Jr. and his colleagues on the Supreme Court left for their summer break at the end of June, they marked a milestone: the Roberts court had just completed its fifth term. In those five years, the court not only moved to the right but also became the most conservative one in living memory, based on an analysis of four sets of political science data. ^ Caplan, Lincoln (2016-10-10). "A new era for the Supreme Court: the transformative potential of a shift in even one seat". The American Prospect. Retrieved 2019-02-01. The Court has gotten increasingly more conservative with each of the Republican-appointed chief justices—Warren E. Burger (1969–1986), William H. Rehnquist (1986–2005), and John G. Roberts Jr. (2005–present). All told, Republican presidents have appointed 12 of the 16 most recent justices, including the chiefs. During Roberts's first decade as chief, the Court was the most conservative in more than a half-century and likely the most conservative since the 1930s. ^ "A Bad Day for Democracy". The Christian Science Monitor. 2010-01-22. Retrieved January 22, 2010. ^ Glick, Joshua (April 2003). "On the road: The Supreme Court and the history of circuit riding" (PDF). Cardozo Law Review. 24. Retrieved 2018-09-24. Gradually, however, circuit riding lost support. The Court's increasing business in the nation's capital following the Civil War made the circuit riding seem anachronistic and impractical and a slow shift away from the practice began. The Judiciary Act of 1869 established a separate circuit court judiciary. The justices retained nominal circuit riding duties until 1891 when the Circuit Court of Appeals Act was passed. With the Judicial Code of 1911, Congress officially ended the practice. The struggle between the legislative and judicial branches over circuit riding was finally concluded. ^ Mendelson, Wallace (1992). "Separation of Powers". In Hall, Kermit L. The Oxford Companion to the Supreme Court of the United States. Oxford University Press. p. 775. ISBN 978-0-19-505835-2. ^ Vile, John R. (1992). "Court curbing". In Hall, Kermit L. The Oxford Companion to the Supreme Court of the United States. Oxford University Press. p. 202. ISBN 978-0-19-505835-2. ^ Leiter, Brian (19 March 2017). "Let's start telling the truth about what the Supreme Court does". Washington Post. Retrieved 13 June 2018. Frank, John P. (1995). Friedman, Leon; Israel, Fred L., eds. 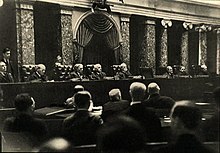 The Justices of the United States Supreme Court: Their Lives and Major Opinions. Chelsea House Publishers. ISBN 978-1-56802-126-3.